Ten years ago Steve Harmison was giving Australia's batsmen sleepless nights, unleashing 90mph deliveries during an unforgettable summer of cricket which saw England regain the Ashes. On Saturday, the 36-year-old will take his place in the dugout at Woodhorn Lane - home of Northern League Division One side Ashington AFC - in the FA Cup extra preliminary round as he continues his new career as a football manager. When England's cricketers wrapped up a 2-1 series win a decade ago they were given a rapturous reception by tens of thousands of fans in Trafalgar Square at the end of a victory bus parade. A Downing Street reception followed but there will be no fanfare for Harmison and his Ashington players if they see off Bradford-based Albion Sports at the start of the long road to Wembley. The ninth-tier club, whose average league gate last season was 222, will still be another five victories from the first-round proper. "If someone had told me in 2005 that I'd be manager of Ashington in the FA Cup 10 years later I wouldn't have laughed at them," Harmison, who took 17 wickets during the epic five-match series a decade ago, told BBC Sport. "It's my hometown club. I played for them before I became a professional cricketer. My dad, Jimmy, played for them, and my brother, James, plays for them now. "Even when I was playing cricket for England I used to train with Ashington to help build up my fitness ahead of tours to Australia, West Indies and South Africa. "I love being a football manager. It's a great challenge and I like being around non-league players for their enthusiasm. I can't wait for the FA Cup." Harmison has been put in charge of a team from a town that produced England international Jackie Milburn, as well as the World Cup-winning Charlton brothers, Bobby and Jack. The club from the former mining town in Northumberland, situated 15 miles north of Newcastle, are nicknamed the Colliers and were elected to the Football League in 1921 before being voted out just eight years later. Between 1909 and 2008 they played their home games at Portland Park before moving to their current £1.2m Woodhorn Road base, where a 250-seater stand is due to open in October. "Ashington's a tough place, a mining community," chairman and local MP Ian Lavery told BBC Sport. "I've heard people say that appointing Steve was a publicity stunt, but why would it be? We're ambitious and Steve is a sports star." Sixty-three Test matches, 226 Test wickets, 58 one-day internationals, two Twenty20 internationals... Harmison's England statistics make impressive reading. But the former bowler was playing football for Ashington before he was offered his first professional contract at Durham in 1996. "Football has always been a huge part of my life," added the lifelong Newcastle fan, who was appointed Ashington boss on 8 February, along with coaches Ian Skinner and Lee Anderson. "I saw the club was looking for a new manager and decided to put my name forward." Ashington's hierarchy were so impressed with Harmison during his interview that they offered him the job on the same day. "We had 10 applicants including some from people who had played the professional game and others who were managing at a higher level," added Lavery. "We interviewed Steve, Ian and Lee on a Sunday afternoon in the Labour Party offices in Ashington. They were excellent - Steve oozed confidence. We said we'd get back to them and later that afternoon we called a board meeting and agreed that they were the right men to take the club forward. "We immediately rang to tell them. Steve's a likeable lad, a real people person and very approachable. He'll stand in the bar after games and chat with fans." Lying 17th in the Northern League table and on a six-match losing streak, the Colliers were heading for relegation and the 10th tier of English football when Harmison was appointed six months ago. Steve Harmison famously claimed the wicket of Michael Kasprowicz on 7 August 2005 at Edgbaston, allowing England to complete a two-run victory over Australia and level the series at 1-1. One of the first things Harmison did after being appointed manager of Ashington was sign his younger brother James, 34, a defender with vast experience in the Northern League. Former England cricketer Andrew Flintoff, a close friend of Harmison's, made a guest appearance as an unused substitute for Ashington AFC in a pre-season friendly against hometown club Preston on 29 July. Ashington opened their 2015-16 Northern League campaign with a 3-1 defeat at Washington on 8 August before losing by the same scoreline at home to Penrith on Tuesday. But seven straight league and cup wins transformed the season and propelled the Colliers to 13th in the table, prompting former England cricket captain Michael Vaughan to post a tongue-in-cheek tweet: 'Hearing @Harmy611 has now won seven on the bounce as Ashington manager..... [Newcastle owner] Mike Ashley will come calling soon." Harmison was once christened "Grievous Bodily Harmison" by the Daily Mirror after his career-best figures of 7-12 earned England a 10-wicket triumph against West Indies in Jamaica in 2004. Does he show the same aggression towards his Ashington players if his side are losing as he did in Kingston 11 years ago? "I'm not a tea cup thrower," said Harmison. "I've seen plenty of tea cups thrown in cricket dressing rooms throughout my career but I'm all for a fun and relaxed environment. You don't get anywhere shouting. Don't get me wrong, if someone steps out of line they are told in no uncertain terms." Harmy the Football League boss? Harmison has not turned his back on the sport in which he made his name. He is an ambassador for the Professional Cricketers' Association and is not short of media work, particularly during an Ashes summer. But he is planning a long-term future in football management and wants to show how serious he is about his new career by taking his coaching badges. "I said from the very start this is no publicity stunt - people who know me will tell you I'm serious," added Harmison. "I had planned to do my coaching badges this summer but it's been manic with the 10th anniversary of the 2005 Ashes win. "Do I have ambitions to be a Football League manager? Will I still be a manager in 10 months or 10 years? I don't know, I'm just enjoying what I do." "To be honest, I wasn't surprised he put in for the manager's job because I know what this area means to him. I know his family and his mates and he always speaks very passionately about Ashington and the north east. So when he got the chance to manage his home town club, it was a no-brainer for him. 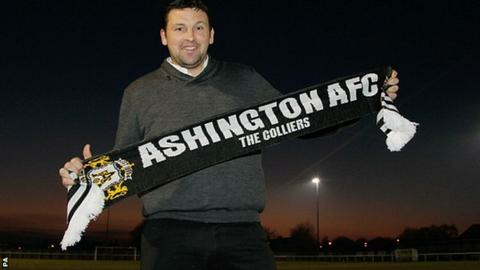 Ashington have got someone in charge who actually loves the place and that will rub off on the players - and the club." You have to go all the way back to the 1926-27 season to find Ashington's best FA Cup run, when they reached the third-round proper before losing 2-0 to Nottingham Forest. More recently they came within 90 minutes of the first round before losing 5-0 at Grimsby Town in 2011. Can Harmison inspire the Colliers to a memorable run this season? "There are almost 400 teams taking part in the extra preliminary round alone," he said. "Each one of them has a burning desire to play a full-time club in the first round. We are no exception." Who will win Europe’s major leagues? Read more on La Liga, Serie A, Bundesliga, Ligue 1: Who will win titles?